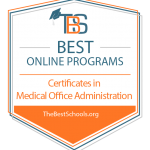 The Medical Office Administration program prepares individuals for employment as medical administrative personnel in the areas of medical office, medical billing and coding, medical auditing, dental office, and patient services. Coursework includes medical terminology, computer applications, medical office simulation, electronic health record, medical coding, medical insurance and billing, medical legal and ethical issues, medical auditing, oral and written communication, and other topics depending on the subject area selected within this curriculum. For more information, contact the Wanda Tenpenny, Instructional Coordinator, at 252-493-7509 or wtenpenn@email.pittcc.edu. Students will demonstrate problem solving abilities to assign ICD-10-CM codes to diagnoses and CPT codes to procedures in an outpatient facility. Students will demonstrate proficiency in compiling data for CMS-1500 claim form completion. Students will demonstrate proficiency in using electronic information resources accurately to schedule, bill, update, and make corrections in patient management software. Students will demonstrate proficiency in using electronic health information software to create, update, and maintain patient health records. Students will apply federal privacy laws and HIPAA regulations to healthcare situations.